A season-long climb from an early hole landed the Houston Rockets in the NBA playoffs. A stunning collapse couldn’t keep the Miami Heat from the No. 3 seed in the Eastern Conference. The Rockets earned the final postseason spot Wednesday night with a 116-81 victory over Sacramento, giving them the No. 8 seed in the Western Conference and officially making Kobe Bryant’s final game nothing more than a ceremony. Houston earned a second shot at Golden State, a year after losing in five games to the eventual NBA champions in the Western Conference finals. Utah would have finished eighth with a Rockets loss and a victory over the Lakers in Los Angeles, but the Rockets won their third in a row to finish 41-41 after a turbulent start that included the firing of coach Kevin McHale. The Warriors-Rockets rematch was the only West series set as the regular season headed into its final hours. The East was determined earlier, though with a detour from what looked like a simple path. Miami was cruising toward a victory in Boston that would have wrapped up the No. 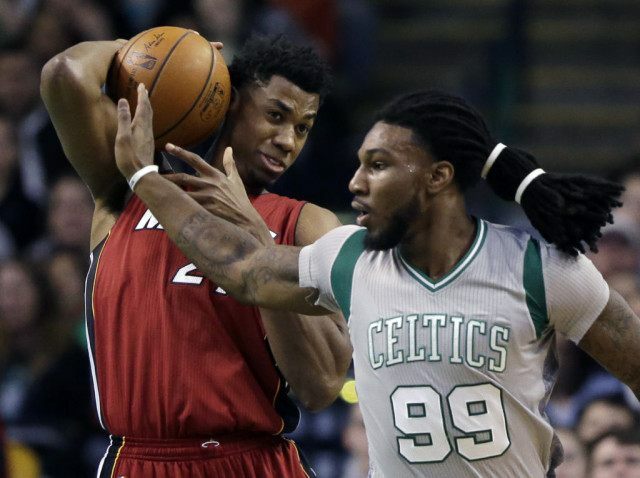 3 seed, but the Heat were limited to five points in the third quarter and lost 98-88. Still, they finished third anyway by a tiebreaker when Atlanta fell to Washington. The Hawks are the No. 4 seed and will face the No. 5 Celtics, while Charlotte is seeded sixth and opens at Miami. In the other East series, top-seeded Cleveland will face Detroit, while No. 2 Toronto meets seventh-seeded Indiana. The playoffs open Saturday. Schedules were to be released by the NBA later Wednesday.